Wever Community Hub | A book for every child! Over 750 books found a new home. The gift of literacy took place at Cathy Wever School. The Books, Books, Books Project took place on June 12th in the school library. Students had the opportunity to select a new book of their choice to take home and enjoy. Tables filled with books welcomed students as they came to select a new book to take home. The Books, Books, Books Project is operated by the Rotary Club of Hamilton and helps put books in the hands of children. 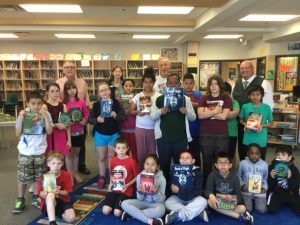 Rotarians and staff from the Hamilton Public Library help students select a book to enjoy. This literacy projects continues the ongoing work of the Rotary Club of Hamilton’s literacy initiative in our community. The concept is simple “To make sure every child has a book of their own at home, to help encourage the joy of reading” said Rotarian Paul Takala, who is the Rotary lead on this project. The Rotary Club of Hamilton focuses on literacy initiatives by providing books for children at Christmas and during the Books, Books, Books Program. In addition, the Rotary Summer Literacy Program offers three weeks of free camp style programming and offers participants a book to enjoy after the program. The project would not be possible without the support and help of the Hamilton Public Library and First Books Canada and the many donors who support the fundraising activities of the Rotary Club. As the pictures show, the students had a great time selecting their new book and even started reading it that day! A wonderful service projects and the gift of literacy!